1. In "Rise"[VOY], a shuttlecraft crashed into the surface of the planet at a significant speed. Her speed was Mach 2.1 at 15 kilometers altitude (on Earth, 2.1 @ 15km = 620 m/s) . . . about 10 seconds later, a layer of "electrodynamic turbulence" disabled the propulsion systems and main power, resulting in a crash (in other words, the shuttle dropped like a brick, and shields were unlikely). Simple atmospheric drag might have slowed her down, but then again I'm not sure what terminal velocity for those Federation flying bricks is. Though most of the main systems were knocked offline or destroyed, the structural integrity of the craft was not compromised, and she came to rest in one piece. Shuttles would seem to be the joke about making the whole airplane out of black box material brought to fruition. Also, this places the TIE fighters destroyed in slow collisions with asteroids in TESB in a rather unfavorable light. And let's not forget those AT-STs crushed by a couple of tree trunks. 2. The Falcon and Fett aren't the only ones who can navigate asteroid fields. Check out this vidcap from "Change of Heart"[DS9-6]: (danube-aster1.avi, DivX5, 420k). And note how dense that field is . . . makes AoTC and especially ESB look like child's play. 3. (Thanks to "Spike" and his "Star Trek Page") The Federation has specialized "geo-terraforming" vessels. One of these is the U.S.S. Strata, operational since at least 2355 (nine years before the first season of TNG). I would conjecture that such vessels are used to alter the geography or geology of a planet in precise ways, though such conjecture is by no means canonically certain. 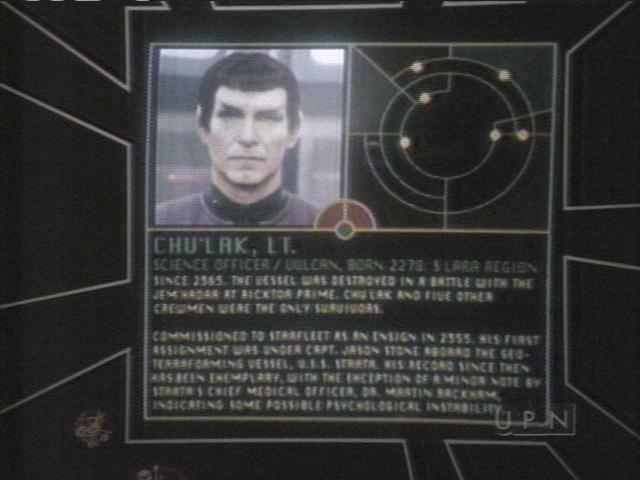 This information comes from a computer display seen in DS9's "Field of Fire". 4. Warsies such as ASVS's "Graeme Dice" have been making absurd claims about warp drive in Star Trek, suggesting that the subspace damage caused by warp drive (learned of in "Force of Nature"[TNG]) is, in fact, proof of a slowdown of warp drive, and that it prevents warp combat, and that it prevents warp strafing, et cetera, et cetera. Funny that the damage to subspace over the years of warp use at the Hekaras Corridor and by the Hekarans was so limited as to be virtually unnoticeable (even in a region that was already unstable to begin with), and that they'd have to expose one of the pockets of instability to energies a million times greater than a starship would normally produce in order to test the theory at one of those pockets of instability, even after all that time and the cumulative nature of the effect. Funny that the Hekaras Corridor is the only region of space known to be that unstable, meaning that it's the *only* place where one would be most likely to notice the subspace damage, and it *still* took an engine overload in one of the pockets of instability to make it noticeable at all. Funnier still that this example is used to claim that starships have slowed down tremendously and lost capabilities over the years. Nah . . . actually, that's not funny at all. It's just sad. 5. Interesting . . . Starfleet offers knives to the crew. 6. Data's storage capacity, as quoted in "Measure of a Man"[TNG], is 800 quadrillion bits. Converting to terabytes, that's 90,949.47 terabytes of the computer engineering sort (where, for instance, 1024 bytes equals a kilobyte), 100,000 terabytes using the straight SI "tera-" prefix. The human brain's storage capacity is unknown, but estimates can be made. It has about 100 billion nerve cells. If the brain used straight binary, that would only be about 100 gigabytes. However, the brain is a very complex piece of equipment, with numerous interconnections which can store and process data in a more analog fashion. Estimates of the actual storage capacity of the brain are in the terabyte range, with about 1 terabyte at the low end, and nearly a petabyte (1000 terabytes) at the higher end. Note that this does not automatically mean that Data is 90 - 90,000 times smarter than everyone else . . . it does at least suggest, though, that he ought to have a very good memory. 7. In 2152, the Enterprise demonstrated the ability to achieve a speed of 1460c (12 light-years in three days) in "Cease Fire"[ENT]. Assuming this was a near-maximum velocity (as suggested by the overworking on the injectors), the distance to Q'onos in "Broken Bow" could be estimated as 1500c for four days from Earth. This would suggest that the Klingon homeworld is a mere 16.44 light-years from Earth, tops. 8. Dead Men Walking: Three main characters are, for the last part of their respective series, dead men. "Writers, start your technobabble!" The first, of course, is Spock, whose death was seen in Star Trek II. Technobabble (the Genesis planet) restored his corpse (or perhaps made a genetically-identical child out of it which (re-)aged rapidly), and Vulcan neurobabble (a special mind-meld refusion) restored his mind to it. I suppose that, depending on how far one wishes to carry the idea of resuscitation, this might fall within it . . . but only barely. I'd consider the new Spock more along the lines of a clone. The second is Chief Miles O'Brien. (The writers seemed to really enjoy running him through the ringer in DS9.) In "Visionary", technobabble1 (some radiation thingy) plus technobabble2 (some radiation thingy from an orbiting quantum singularity) causes O'Brien to shift into the future every few hours, physically manifesting there. After a shift showing the station's destruction, O'Brien has himself irradiated to produce an intentional, controlled shift. There, it is discovered that the source of technobabble2 is the reactor of a cloaked Warbird set to destroy the station. The shifting Miles from our time period is unable to make it back due to the radiation, and sends the future O'Brien in his place. (See, they even killed him!) As Bashir puts it, in a practical sense future O'Brien is just regular O'Brien, plus a few hours' worth of memories of things that no longer happened. In an objective sense, though, he's a duplicate from an excised alternate timeline, a la the Tasha Yar recovered from the Enterprise-C in 2344. In a material sense, though, he's closer to the original O'Brien than the Spock "clone", since the way temporal mechanics are treated in this episode suggests that both O'Briens really were O'Brien. This means, then, that Ensign Kim (and Naomi Wildman) are dead . . . living duplicates, synthesized by a spatial scission (a subspace divergence field), have taken their place. This is a further separation from originality than in the case of O'Brien, and even Spock. The latter's new body was a clone created from and including original materials, but Ensign Kim's original materials are floating in space somewhere in the Delta Quadrant. In short, he was replicated. 9. In "Twilight"[ENT3], we are shown an alternate-timeline future in which the Xindi successfully deploy their Earth-shattering weapon. A great deal of speculation has occurred about that weapon, and whether it employed some sort of chain reaction or whether it was a weapon of raw energy. Though the special effects artists did a great job of making it look much more like a (core-blasting) pure energy weapon than did ILM with the Death Stars, the fact remains that the weapon had to have involved a chain reaction. Why? Because the prototype from "The Expanse"[ENT2] did.
" - Simultaneous access to 47 million data channels. - Transluminal processing at 575 trillion calculations per nanosecond. - Operational temperature margins from 10 degrees Kelvin to 1,790 degrees Kelvin." That temperature margin, incidentally, translates to between -263°C (-441°F) and 1,516°C (2,760°F). That upper margin is above the melting point of silicon, and just a few degrees shy of the melting point of iron. In other words, long after your desktop or laptop had turned to goo, the Voyager processor would be going strong. As a result of the stated margins, we can conclude that there are very few thermal situations where the computer would cease functioning. As for the processor speed, that's 575,000,000,000,000 calculations per nanosecond. Or, in one second, 575,000,000,000,000,000,000,000 (575 sextillion) calculations. It sounds amazing, but isn't really that impressive if viewed in the light of the past few decades of advancement, or what is known to be over the horizon. Before you start projecting off of the lists to see how long it should be until we're processing that quickly, though (which is what I did at first . . . the latest home PC date was 2131, incidentally, with the earliest supercomputer date being about 2027), you should stop to consider a couple of things. First, Moore's Law cannot last indefinitely . . . there's a point at which modern electronic computers simply cannot get any faster. Second, the future of computing is not electronics or even photonics, but quantum computing. A tiny 30-qubit (quantum bit) processor would have the same processing power as the supercomputers circa 2000 . . . and we've already created 7-qubit processors. The description given for Voyager's processor seems to make it sound like a really-advanced Pentium . . . or a really small (no pun intended) quantum computer. And, with the term "transluminal" being employed, it makes the whole thing sound worse . . . after all, even if I could stick a 286 processor in a warp field and thus somehow have a nice easy "cheat" to make it faster, then my processor tech would still be that of a crappy, slow 286. Thus, if Voyager's processor is only capable of 575 trillion calculations per nanosecond in a magic speed-me-up warp field, then outside that field it must be barely faster than a supercomputer of today. That's just one interpretation of the quote, though, based on one possible meaning of "transluminal processing". But, there is an alternative interpretation. The processor speed the computer gives is for "transluminal processing". This may mean that the computer is only capable of that many calculations per second regarding only FTL computations, which we might expect to be of great importance when the ship is at warp . . . but mere luminal computation speed (such as what one would get out of electronic, photonic, or quantum processors) is not given. Given that quantum computing promises extraordinary computational speeds beyond that which Voyager's processor reports, but cannot do so at FTL speeds, this may imply that her raw processing should be more impressive at non-FTL. 11. "Vortex"[DS9-1] . . . Odo gets knocked unconscious by a falling rock. Odo's said something to the effect of 'when I'm a rock, you scan me as a rock', but this would be the only example I know of of a changeling demonstrating humanoid weaknesses in humanoid form. The only other time I recall Odo getting knocked out was "The Assignment"[DS9-5], at which point he'd been made into a "solid" by the Founders. 1. (Thanks to "Ralson" and T. Lee) The SPHA-T ground artillery weapons from AoTC were so power- and support-intensive that they could not be mounted on capital ships. The text from the source makes it clear that capital ships of the era were incapable of powering and supporting such a device. Given the specific reference to power requirements, it would follow that this weapon is more powerful than ship-mounted weapons. Based on the observed effects, this isn't that impressive. Warsies are sure to claim that they'd simply dialled down the power setting when firing against the Trade Federation ship's sphere-section, but this does not follow: the weapon is a line-of-sight artillery device. It can't be too powerful, or else it will preclude its own utility by destroying itself when fired. This served as clearance radii for the effects of the simple antigrav drive, which boosted all spacecraft clear of the gravitational field of the planet. The mathematics of spacedrive were simple enough even to Luke. Antigrav could operate only when there was a sufficient gravity well to push against -- like that of a planet -- whereas supralight travel could only take place when a ship was clear of that same gravity. Hence the necessity for the dual-drive system on any extrasystem craft. Some bright spark working with the EU realized that if a ship could project an artificial gravity field (such as the one(s) found within the ship) around the vessel, and if it were of sufficient size, it might block the hyperdrive entry efforts of an opposing nearby ship. Of course, there are various problems with the idea as later manifested in the EU, but in principle it was pretty good. However, we don't see any indications of such technology in use in the film universe. On occasions when such a thing might've been useful to trap enemy fleets or starships . . . Hoth, Endor, et cetera . . . it is absent. Further, if one had projectors capable of creating such a field, one would expect the Empire's mere tractor beams to be extremely good (provided that they operate along the same graviton-based principles as the projectors). This is not the case, though . . . recall that the Falcon was able to noticeably slow her approach toward the Death Star while being tractored in, while at a range of only several hundred kilometers. One interesting question this brings up, however, is what a Starfleet tractor beam might do to a Star Wars vessel trying to engage hyperdrive. We know from "Captive Pursuit"[DS9-1] that a graviton field is involved in the tractor beam's hold on a ship, and we know from examples like "Final Mission"[TNG4] and "The Ship"[DS9-5] that a tractor beam can produce much more than a single g of acceleration on the tractored vessel. It seems likely, then, that a Star Wars vessel's hyperdrive efforts would be thwarted if a tractor beam were employed.